Significant traffic congestion at the Oxford bypass bottleneck, and the need for improved access to the Sainsbury’s Supermarket site, led to the commissioning of an important project – a massive new roundabout. Independent transport consultancy Mayer Brown won the tender for this project, and elected to use 12d Model as their design software. The proposed roundabout entailed the re-alignment of the existing roundabout and adjoining ‘A’ Roads, with the A4074 alignment being restricted by the existing railway overpass bridge to the South of the Oxfordshire site. Traffic analysis and Site Surveys were carried out prior to design work being started. This initial work was critical in assessing how Mayer Brown could increase efficiency while reducing design development costs. 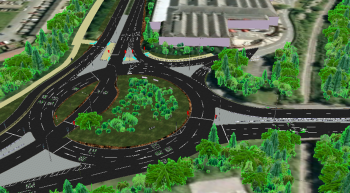 The new proposal entailed additional lanes being ‘cut’ through the centre of the Heyford Hill roundabout to ease congestion, thereby providing a ‘through route’ for the A4142 onto the A4074 (Southern Bypass Road). The roundabout was re-aligned to cater for additional lanes, as well as the incorporation of signalised junctions to assist with traffic movements. 12d Model was used to design the layout so that the proposal could be constructed accurately. The need to adhere to the UK’s ‘DMRB’ K-values meant that the vertical design became ‘somewhat challenging’, as they had to tie in with existing roads, drainage, and crossfalls, while maintaining a design path that complied with the standards, without compromising the efficiency of the layout. As with most design projects…‘for every action, there is an equal and opposite reaction’. Despite changing the roundabout dynamics, the existing drainage network had to be retained. This meant that cambers had to be designed to fit with both gullies and vehicle paths without adversely affecting the rideability around the roundabout. The solutions evolved from utilising superalignments, modifiers, and additional ‘forced break’ superalignments – all within 12d Model. While conventional design tries to utilise the application of templates from centrelines, Mayer Brown found that the optimal approach varied depending on which junction they were at. In some cases, the split carriageways assisted with deciding on template use, while others were best suited to superalignments being used as kerb alignments. Forced contours were used to enhance the final surface finish.The implementation of a specific design strategy, incorporating chains was critical to the success of delivery. Due to late changes, the ‘chain setups’ allowed for a practical resolution and efficient delivery of product This was of further assistance in delivery of the visualisation at the conclusion of design works.